A space to have controversial and challenging conversations! South Africa is a multiracial and democratic country where citizens have the right to express their thoughts and feelings. However, often times it seems difficult to digest what people say; be it in the media and conversations about the country’s economic state, race, equality and other issues, without personal offense. Social media is a buzz with people’s frustration and extreme views on race and racism. If we continue to speak only when we are angry, the ideal that is captured in the notion of a ‘rainbow nation’ will forever remain divided. Spaces and opportunities where people with diverse views are able to express themselves, be heard and understood, need to be encouraged. Rather than throwing stones from perceived polar opposite opinions, people need to find ways to dialogue their diversity. One such space is offered by the Working With Groups (WWG). The course is much more than a course, it is a space that allows for an opportunity for people from diverse backgrounds, cultures and languages to think together, and engage each other in an effort to heal trans-generational traumas. 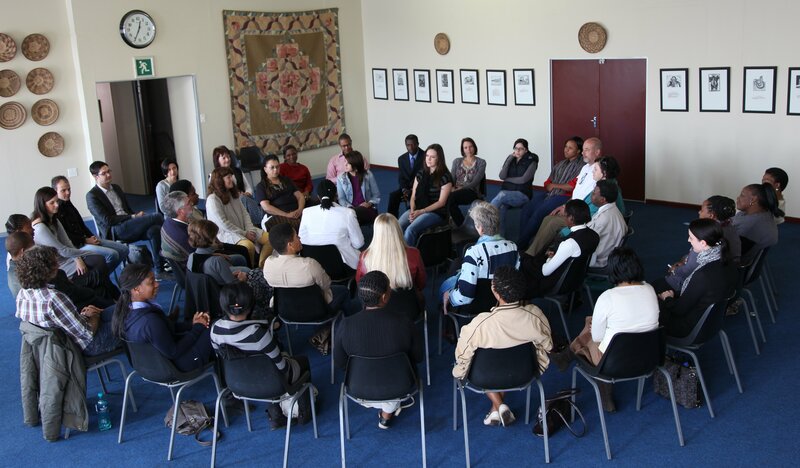 On the Working With Groups (WWG) course, the diverse groups of everyday life in our homes, communities and workplace, engage in conversation, so that everyone may learn to participate more effectively in South African communities. Although we continue to struggle with our historical and current divisions, through conversations we can achieve a part of transformation required. Courses which build human capacity in the field of group work, particularly developing the skills and knowledge of group facilitators and leaders, as well as trainers of group work, are urgently needed to deal with the challenging mental health issues as well in our society. This introductory course has been designed to meet South African realities, requirements and resources. It is influenced by the models developed by the London-based Institute of Group Analysis and the Tavistock Clinic.